OOh have just started to play with the wonderfall stamp set and matching leaf die. Its wonderful! I collected together DSP in autumn colours and picked out similar shades of ink including old olive, summer starfruit, crumb cake and tangerine tango. I cut the Dsp so that I had about 1 dozen of each leaf/paper shade. Before I looked at the leaves I used the diamond glaze to coat the acorns. Then I sat arranged the leaves on a dinner plate until I was happy with the layout. This did take a bit of time. The dsp is so good that curling with the scissor blade was enough for them to hold their shape whilst I glued them all in place. When the circle was complete I went to gather the now dry acorns only to find 2 missing. When I went to bed I found them stuck to the bottom of my cardigan and they didn't want to come unstuck! This is another flowery one but I switched to the paint brush! Dainty, pretty and very girly. What more can I say. And another one, again the picture isn't up to much, I did try with the flash but that just made everything orange coloured. This is a very old Anna Griffin stamp which I just couldn't let go of. 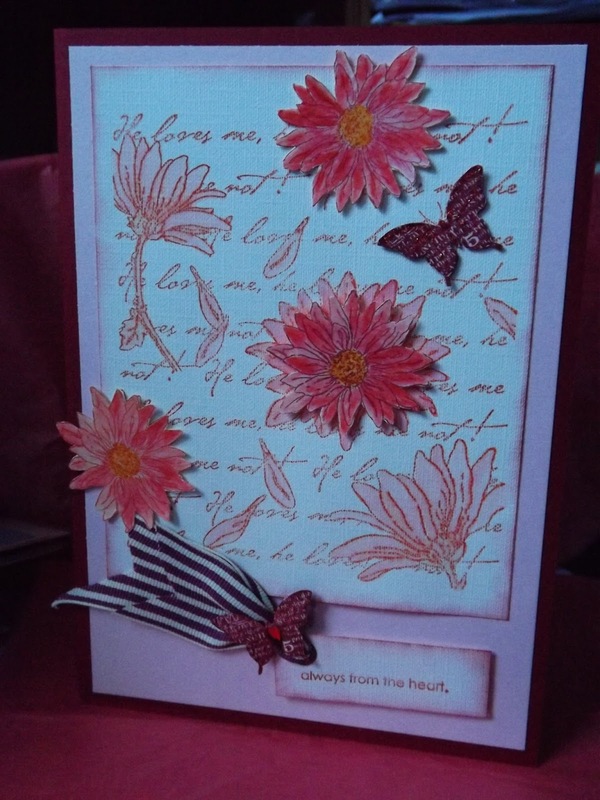 I have done this one in lots of colour ways, it works well in pinks and even greens! The chalk box has been busy this week with some of my favorite stamp sets. The range and depth of colour you can get with a cotton wool ball and a piece of chalk always amazes me. I have then raided my stash for matching ribbons, beads and other. Lets just say 'off piste' this week! The picture really does not do this justice. 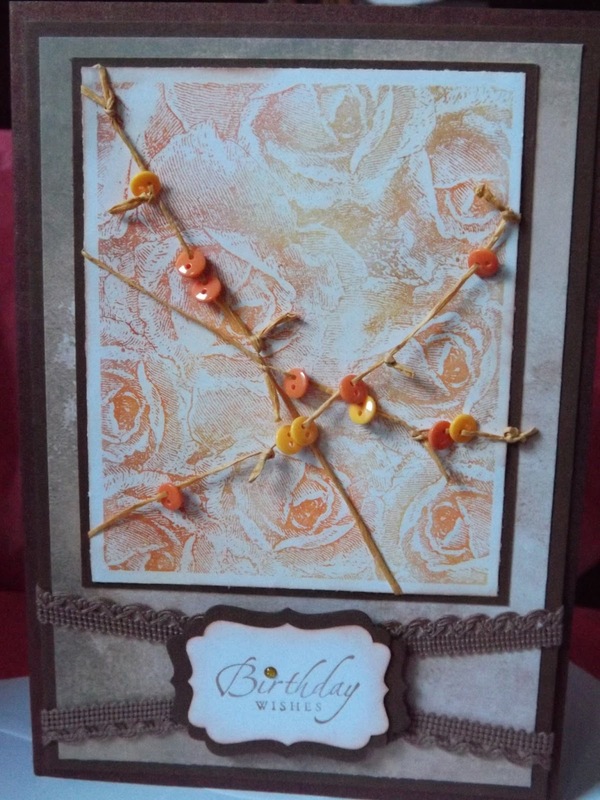 This card is C5 , haven't made any of these for a while. Great news you can now shop for your Stampin'Up! goodies online from the comfort of your sofa. I am unsure how to create the page here...... will learn and be back. Meanwhile go and look at the page, use the 'SHOP' button in the top right hand corner. I hope to be back with what the page looks like and perhaps a special offer. I made this last week at a Clare Rowlands class. Not only are her stamps lovely she really is a paper engineer..
We made the box frame from one 12 x 12 sheet of card. Then cut DSP to fit inside, outside and around the side of the middle part. 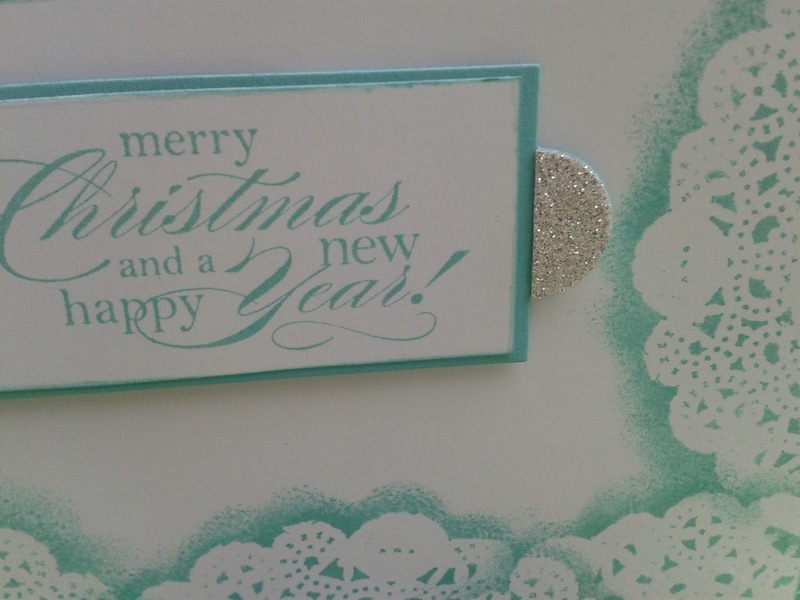 I'm not sure which die was used to create the snowflake but it is pretty. We used lumpy embossing powder mixed with glitter to do the snow on the trees. I then used copic markers to colour and decoupage the snowman. The carrot nose and berries on the holly are coated with crystal effects. I really like this and will be making a few more. Acetate, that's the key to my next couple of makes until I settle on the one for the class on the 30th September. Places still available! 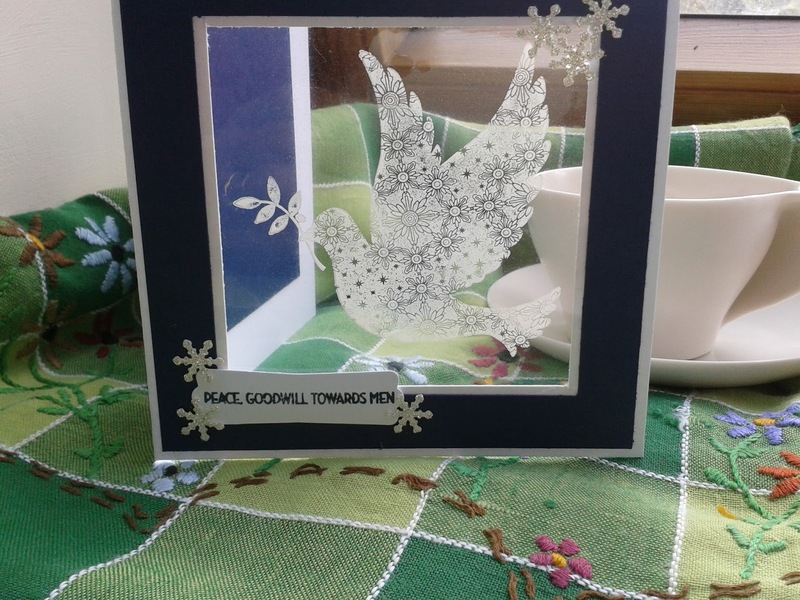 I have stamped on the acetate with white stazon. I am well pleased with the results. It shows off the fine intricate detail in the stamp. Not sure which dark blue this is as my order for more midnight muse has not arrived yet. Well, off to work on version 2! 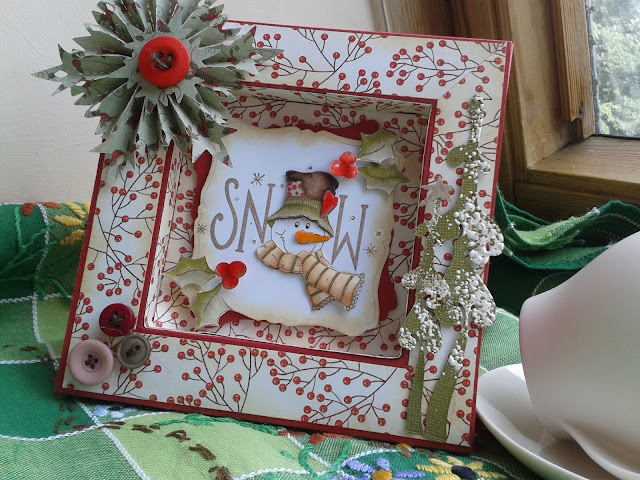 I made this card before my goodies from the Autumn/Winter catalogue arrived. 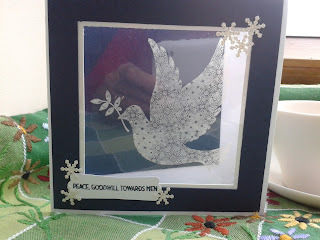 I have used doilies and daubed over them with Costal Cabana. 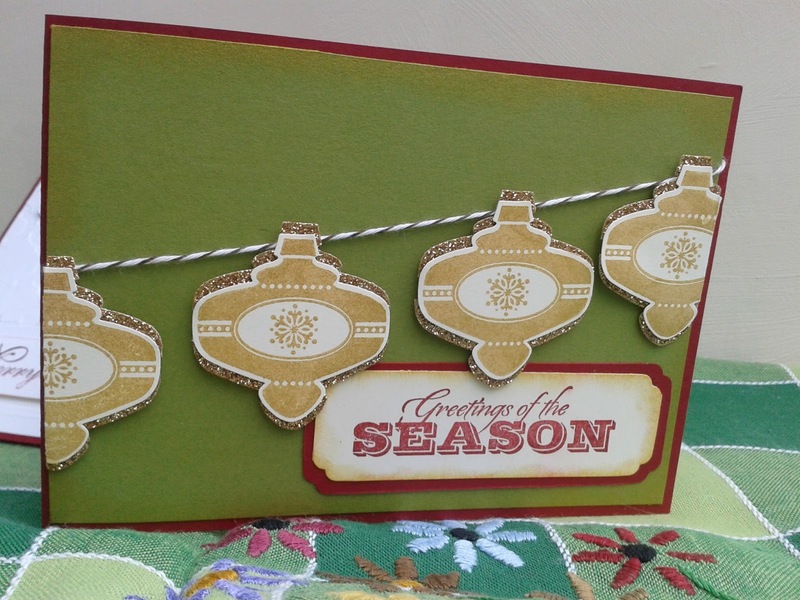 The sentiment is stamped then die cut with the large 'apothecary accents die. I have then punched a 1"circle, cut it in half and used it on each end. I think this use of the silver glimmer paper is really effective. Unusual but I like it. 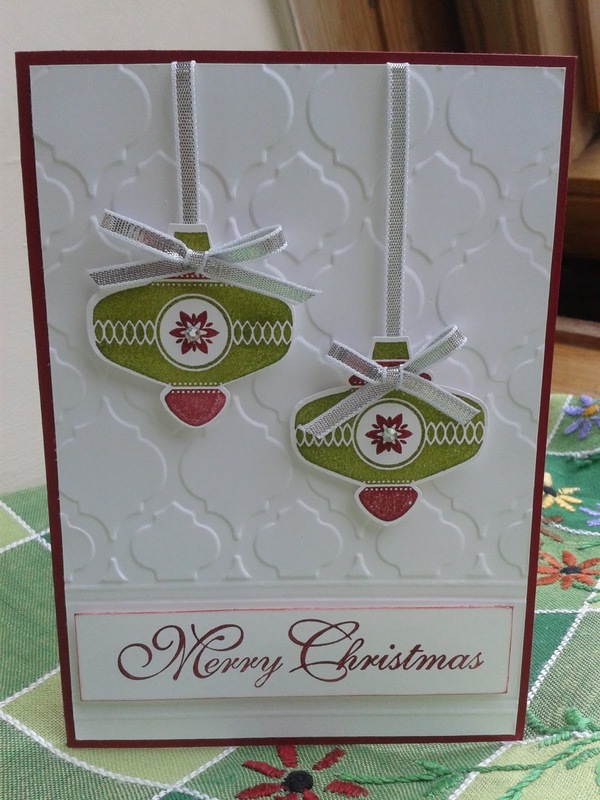 Two more cards made with this set, very similar but very different. 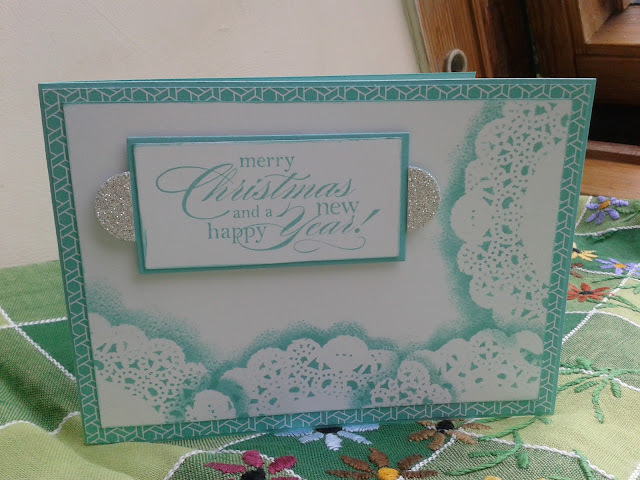 The first uses whisper white, the stamp is coloured with marker pens, punched out, then a bit of bling added to the centre. 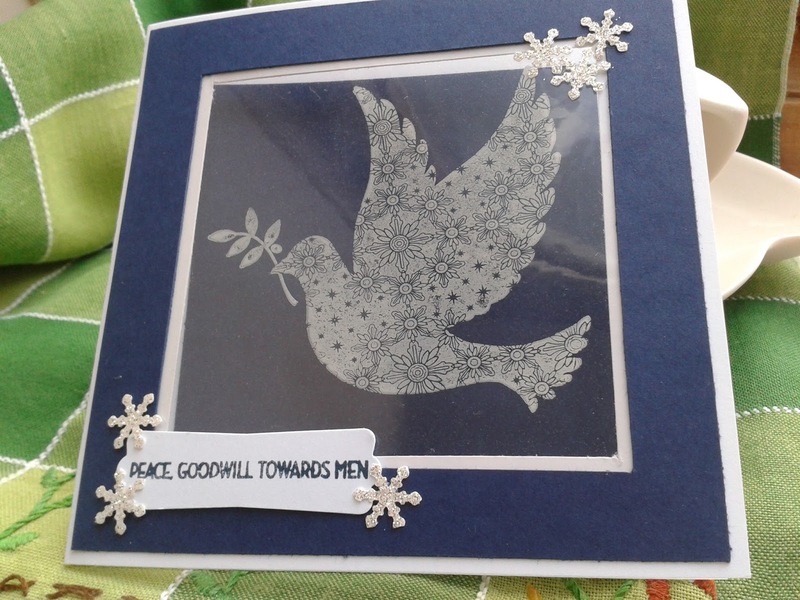 The silver ribbon in the autumn /winter catalogue adds a bit of sparkle. 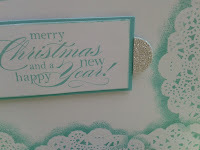 The second card uses crumb cake, champagne glimmer card and the gold ink pad. 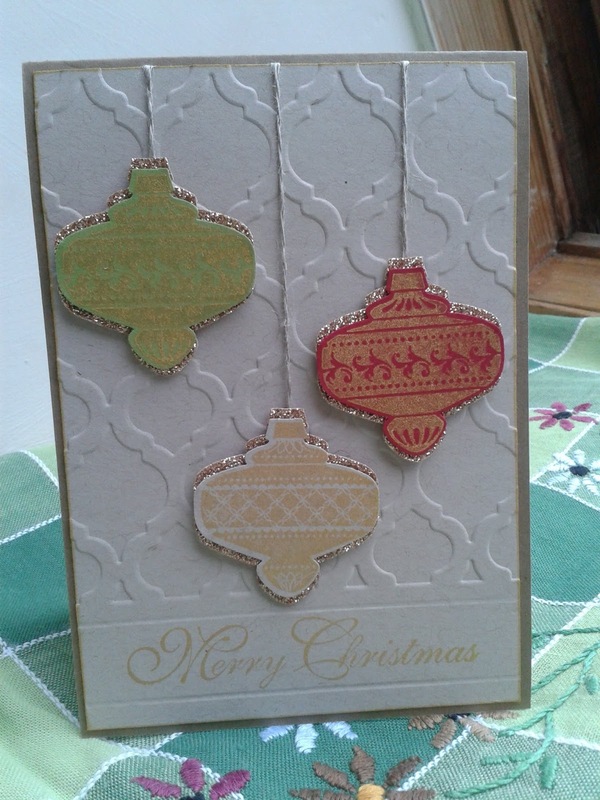 I have used the linen thread to 'hang' the decorations. 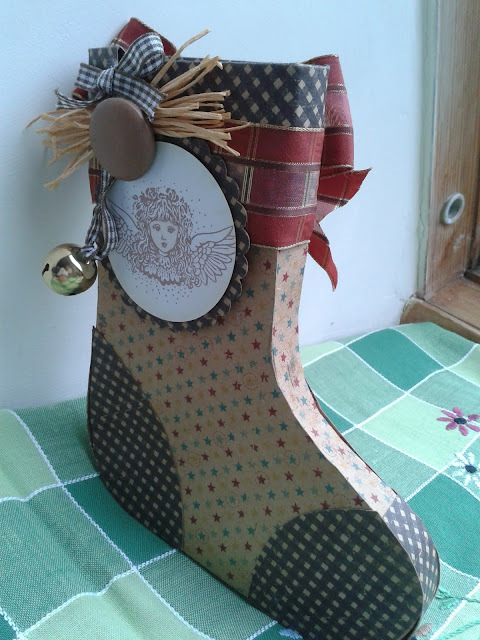 This Christmas stocking is based on a project done with Clair Rowlands last year. 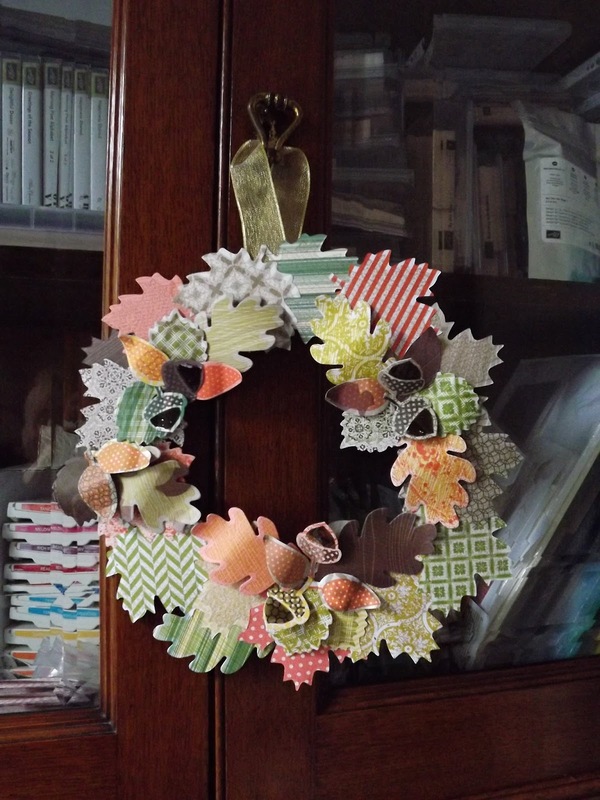 This can be made in a class or you can order a kit. I also have made up stockings for sale. Get in contact for more details. I think it makes an unique packaging for a small gift. This stamp set also comes with a matching punch. I have used it with the champagne glimmer paper which I have to say is really great. I have used the gold ink which is in the new Autumn/Winter catalogue to do the stamping. I have also daubed the gold ink around the edge of the green. It does give a nice shimmer. This set of stamps is fast becoming the most well used of all my sets. 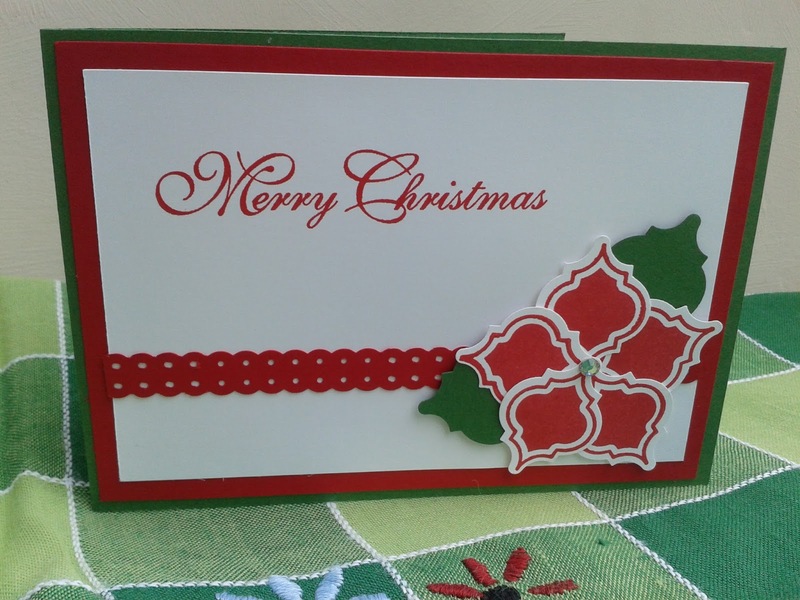 It makes wonderful Christmas cards. These two have been prepared for a mini class on Friday which I am really looking forward to. The first card uses garden green and real red, not my usual choice. It s clean and simple. 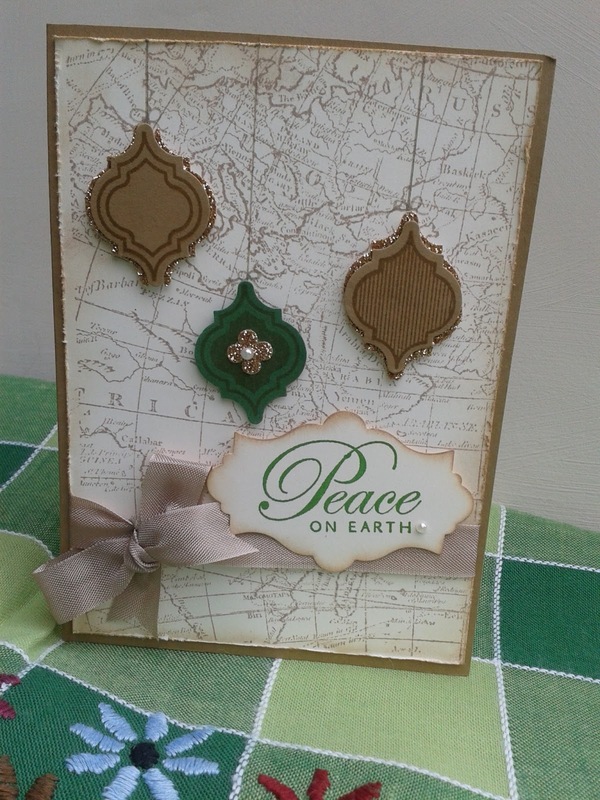 The second card has a crumb cake base and the world map is stamped in crumb cake on very vanilla. 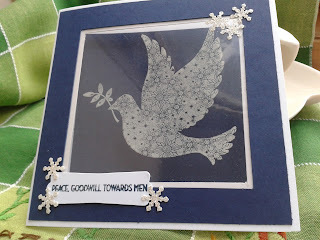 I have used a punch for the glimmer paper as well as the stamping. The sentiment is stamped onto card cut with the small apothecary accents then mounted onto crumb cake seam binding. It has a very different feel.